The complete Mosquito kit set for NZ2328 together in one place! Image courtesy of Denys Jones. Wing components for NZ2328 in their new home. Image courtesy of Denys Jones. The fuselage of NZ2328 in her new home. Image courtesy of Denys Jones. NZ2328 outside for the first time in 30 years as she is moved to her new building. Image courtesy of Denys Jones. NZ2328 nosecone and front fuselage. Image courtesy of Val Dawson. Note: To view a large (1775x1185, 294kb) version of this image, click here. NZ2328 engine. Image courtesy of Val Dawson. Note: To view a large (1775x1187, 420kb) version of this image, click here. NZ2328 wing centre section. Image courtesy of Val Dawson. Note: To view a large (1779x1183, 335kb) version of this image, click here. NZ2328 wing centre section and fuselage side immediately in front of the wing section. Image courtesy of Val Dawson. Note: To view a large (1779x1191, 380kb) version of this image, click here. NZ2328 nose and canopy. Image courtesy of Val Dawson. Note: To view a large (1185x1775, 353kb) version of this image, click here. NZ2328 fuselage, view from in front of the nose. Image courtesy of Val Dawson. Note: To view a large (1775x1193, 298kb) version of this image, click here. NZ2328 fuselage. Image courtesy of Val Dawson. Note: To view a large (1781x1189, 365kb) version of this image, click here. NZ2328 undercarriage unit. Image courtesy of Val Dawson. Note: To view a large (1188x1779, 343kb) version of this image, click here. The fuselage of NZ2328 being positioned on its dolly for working on, May 2000. Image courtesy of Denys Jones. NZ2328 fuselage, February 2000. Image courtesy of Mark Wade. Note: To view a large (1347x915, 220kb) version of this image, click here. NZ2328 fuselage, February 2000. Image courtesy of Mark Wade. Note: To view a large (1355x909, 251kb) version of this image, click here. NZ2328 cockpit interior, February 2000. Image courtesy of Mark Wade. Note: To view a large (1349x897, 375kb) version of this image, click here. BTW, this picture is the right way up, the pilots seat has been removed, the canopy is at the top of the image, trim wheel bottom right. NZ2328 fuselage, Ferrymead Historical Park, NZ, 7th April 1998. Image courtesy of Phillip Treweek. NZ2328 cockpit interior, Ferrymead Historical Park, NZ, 7th April 1998. Image courtesy of Phillip Treweek. NZ2328 fuselage, February 1997. Image courtesy of Mark Wade. Note: To view a large (1506x1015, 276kb) version of this image, click here. 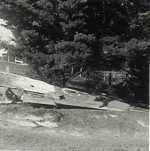 The following 6 images show the recovery of NZ2328 at Maheno in September 1972. Image courtesy of Denys Jones. Image courtesy of Denys Jones. "Then we found two Merlins in Dunedin..." Image courtesy of Denys Jones. "...and it all arrived in our workshop such that we were even still concreting the floor slab by slab and moving the aircraft around to do it." Image courtesy of Denys Jones. Mosquito FB.VI, TE758 was built by Standard Motors at Coventry. Seeing no operation service, the aircraft was delivered to 19 MU at St Athan on 26th August 1945. Sold to the RNZAF, TE758 was flown to Pershore for delivery preparations in February 1947, departing for delivery on 6th March. Arriving in New Zealand on 3rd April 1947, it joined No. 75 Squadron at Ohakea as the C.O. 's aircraft and served as NZ2328 (coded YC-C) until its retirement in the mid 1950's. In the 1950's many of the Mosquitos supplied to new Zealand were stored at Woodbourne and were eventually sold as scrap to whoever wanted them. In the mid 1950's James W. Clarke was the leader of a syndicate which bought Mosquito NZ2328. After being dismantled, the Mosquito was transported to his farm at Totar, near Oamaru. Here the Mosquito stayed until its remains, which included the fuselage, were acquired by the Ferrymead Aeronautical Society in 1972. NZ2328's 'retirement' date is noted in one source as being in 1956, however another states that the aircraft was purchased from Woodbourne in late 1955! If you know for definite which is correct please drop me a line!